Asus has launched Asus Zenfone 5 at MWC with Snapdragon 636 Processor, Dual Rear Camera, 6GB of RAM. Xiaomi Redmi Note 5 Pro also comes with similar Specs. Check out Price, Specs, Features comparison between Zenfone 5 and Xiaomi Redmi Note 5 Pro. 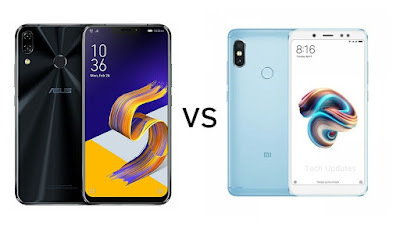 In terms of Design both Phones has iPhone X like Verticle Dual Rear Camera, Asus Zenfone 5 has Notch-like iPhone X and Glass Body compared to a Metal body on Note 5 Pro.Zenfone 5 has 6.2-inch (2246 × 1080 pixels) Full HD+ 19:9 display whereas Redmi Note 5 Pro comes with 5.99-inch (2160 × 1080 pixels) Full HD+ 18:9 2.5D curved glass display. Both Phones have 1.8GHz Octa-Core Snapdragon 636 Processor with Adreno 509 GPU with 4GB/6GB of RAM. Zenfone 5 comes with 64/128GB storage option compared to 64GB on Note 5 Pro. On Camera Zenfone 5 has a 12MP +8MP Dual Rear camera and 8MP front camera.Note 5 pro has a 12MP rear camera with dual-tone LED Flash secondary 5MP camera and 20MP front camera. Zenfone 5 runs on Android Oreo compared to Nougat with MIUI 9.2 on Xiaomi Redmi Note 5 Pro. Asus Zenfone 5 comes in Midnight Blue and Meteor Silver colors and will be available from April. Xiaomi Redmi 5 Pro comes in Gold, Black, Rose Gold and Blue color Priced at Rs 14,999 for 4GB RAM and Rs 16999 for 6GB RAM.